Buffalo wings are an American staple, and we definitely love to chow down on a heaping plate of them from time to time, but those deep-fried, saucy morsels aren’t always friendly to our waistlines. In an effort to get more of that classic flavor into our bellies while still eating healthy, we developed this amazingly tasty – and nutritious – dish that’s proven to be a huge hit in our home! We combined lean, white meat chicken with fiber-packed quinoa, plenty of bright, crunchy veggies, a healthy does of that tangy hot sauce, and of course a little bit of bleu cheese crumbles to top it all off. This hearty salad is bursting with color and flavor – it’s our favorite new way to enjoy Buffalo chicken, and we bet you’ll agree! In a large skillet add vegetable oil, chicken, salt and pepper, and saute over medium-high heat until chicken is just cooked through, about 5 minutes. Add broccoli and sauté an additional 3-4 minutes or until broccoli starts to soften, but is still al dente. In a small bowl combine olive oil, buffalo sauce, and garlic powder. Stir in about half of dressing mixture into chicken, and cook until mostly absorbed, about 5 minutes. 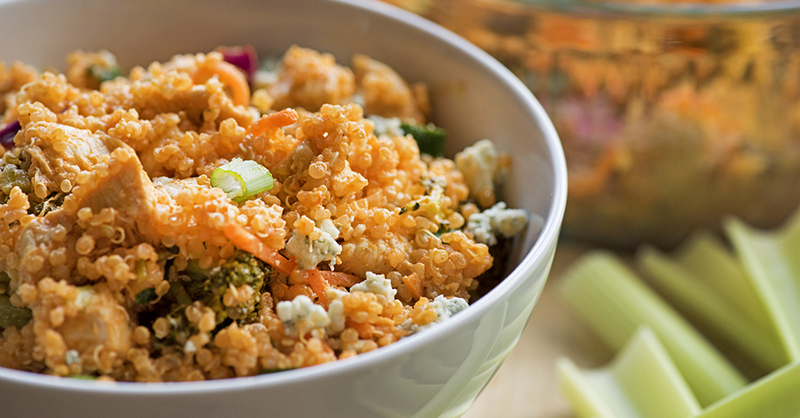 In a large bowl, add chicken mixture, quinoa, carrots, cabbage, bleu cheese crumbles, green onions, and dressing, and toss well until evenly combined. Serve with additional bleu cheese crumbles and green onions, and enjoy!